This study explored the effects of Ellie's Meditative Movements on the symptoms of persons with chronic health conditions. This quasi-experimental study used a pretest, posttest, and follow-up design. Of the 49 participants with a chronic health condition who were enrolled, 24 completed the intervention. During a 7-week intervention phase, five teaching sessions were held in a group setting, and optional practice sessions occurred during a 5-week maintenance phase. Symptoms were measured with the Beck Anxiety Inventory, Beck Depression Inventory, Functional Assessment of Chronic Illness Therapy-Fatigue, and Functional Assessment of Cancer Therapy-General as well as with a blood pressure monitor. 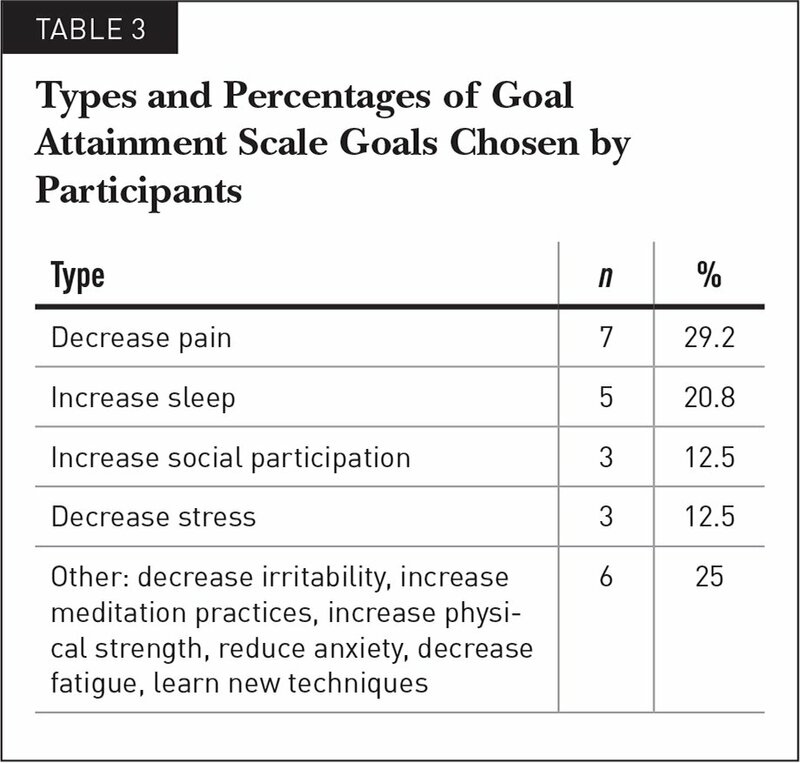 Goal attainment scaling was used to measure participants' goals. Significant improvements occurred in anxiety, depression, fatigue, and emotional well-being from pre-test to posttest and were maintained from posttest to follow-up. Significant improvements occurred in functional well-being and quality of life from posttest to follow-up. No changes in blood pressure occurred. Most participants reported improvements with their goals. The main limitations were the high attrition rate, small sample size, and limited diversity of participants. The prevalence of persons with a chronic condition in the United States is increasing each year, and these individuals frequently experience symptoms, such as fatigue, depression, anxiety, elevated blood pressure, and pain, that affect their quality of life (Li & Zhang, 2014). Because there is no effective cure for chronic conditions, the current focus of health care is on managing symptoms. There is limited evidence on the use of complementary and alternative medicine to manage the symptoms of chronic health conditions. This pilot study explored the effects of Ellie's Meditative Movements (EMM) (Peterson, 2008), a complementary alternative medicine, on the symptoms of persons with chronic conditions. In the United States, arthritis is the most common chronic condition that causes disability, and it affects 52.5 million persons (Centers for Disease Control and Prevention, 2013). Because of the primary and secondary symptoms of arthritis, many persons face barriers that lead to symptoms of anxiety, depression, fatigue, pain, and decreased quality of life (Matcham, Norton, Scott, Steer, & Hotopf, 2016). Fibromyalgia causes chronic pain of the fibrous tissues and muscles and occurs in approximately 2% of U.S. adults (Arnold et al., 2008). Primary symptoms include increased pain, fatigue, and sleep challenges, with secondary symptoms of depression and anxiety (Sumpton & Moulin, 2014). Cancer is the second highest cause of death in the United States, causing weight loss, fatigue, fever, and pain (American Cancer Society, 2017). Because of aggressive treatment and psychological distress, cancer survivors frequently experience secondary symptoms of anxiety, depression, pain, and fatigue (Artherholt & Fann, 2012). Anxiety includes symptoms of restlessness, fatigue, irritability, muscle tension, and sleep disturbance (Reynolds & Kamphaus, 2013a). Depression is characterized by depressed mood, diminished interest, changes in weight, insomnia, agitation, fatigue, and feelings of worthlessness (Reynolds & Kamphaus, 2013b). The symptoms associated with these chronic conditions can cause occupational deprivation, in which people experience difficulties participating in occupations, including activities of daily living, work, and leisure activities (Whiteford, 2000). Persons with occupational deprivation need interventions to reduce their symptoms and increase function and participation (Machado, Gignac, & Badley, 2008; Pergolotti et al., 2017). Participation in physical activity, cardiovascular interventions, and mindfulness interventions can reduce the symptoms of depression, anxiety, and fatigue and increase quality of life in persons with chronic health conditions (Cormie et al., 2015; Durcan, Wilson, & Cunnane, 2014; Penttinen et al., 2011). Complementary and alternative medicine includes wellness practices and mind-body connections to address symptoms (National Institutes of Health, 2018). Tai chi and Qigong have been found to improve quality of life and decrease pain, fatigue, and distress in persons with chronic conditions (Campo et al., 2014; Chen, Hunt, Campbell, Peill, & Reid, 2015; Lee, Chen, & Yeh, 2006; Oh et al., 2012). Participation in mindfulness-based interventions can alter the stress response in the body and reduce the physical symptoms described earlier (Bogosian et al., 2015; Hoge et al., 2018; Rush & Sharma, 2017; Sampalli, Berlasso, Fox, & Petter, 2009). The effectiveness of positive affirmations in treatment has limited evidence, but this practice enhances life satisfaction and decreases stress (Fjellman-Wiklund, Stenlund, Steinholtz, & Ahlgren, 2010; Hamilton, Miedema, MacIntyre, & Easley, 2011). Meditative movements involve body awareness, movements, and breathing for relaxation and stress reduction (Payne & Crane-Godreau, 2013). Intervention with EMM (Peterson, 2008) includes cardiovascular exercise, flexibility, balance, and strengthening exercises, along with breathing and positive core value affirmations. Spoken affirmations are a distinguishing feature of this technique and allow the individual to retrain the mind as well as the body. Approximately 140 types of EMM are available. The study participants were given 25 types of EMM to incorporate into their daily routine. They could adapt the movements to meet their physical ability. One-on-one consultations with the class facilitator enabled participants to explore ways to customize the movements. The use of EMM has not been assessed as an intervention to treat symptoms of chronic conditions. The goal of this study was to evaluate the effects of EMM (Peterson, 2008) on fatigue, depression, anxiety, high blood pressure, and reduced quality of life of persons with chronic conditions. Persons with chronic conditions are at high risk for occupational deprivation and occupational imbalance because of their symptoms (Machado et al., 2008; Pergolotti et al., 2017). This isolation can perpetuate the cycle of many symptoms of chronic conditions. It is important to explore the effects of EMM to find effective interventions that can reduce symptoms in persons with chronic health conditions, enabling them to participate in meaningful occupations. We proposed two hypotheses: (a) persons with chronic health conditions who participate in EMM will experience a decrease in depression, anxiety, fatigue, and high blood pressure and increased quality of life from pretest to posttest; and (b) participants will maintain the benefits of EMM from posttest to follow-up. In addition, we expected participants to show an increase in one or more levels on the Goal Attainment Scale (GAS) at follow-up. This study had a one-group pretest, posttest, and follow-up design. 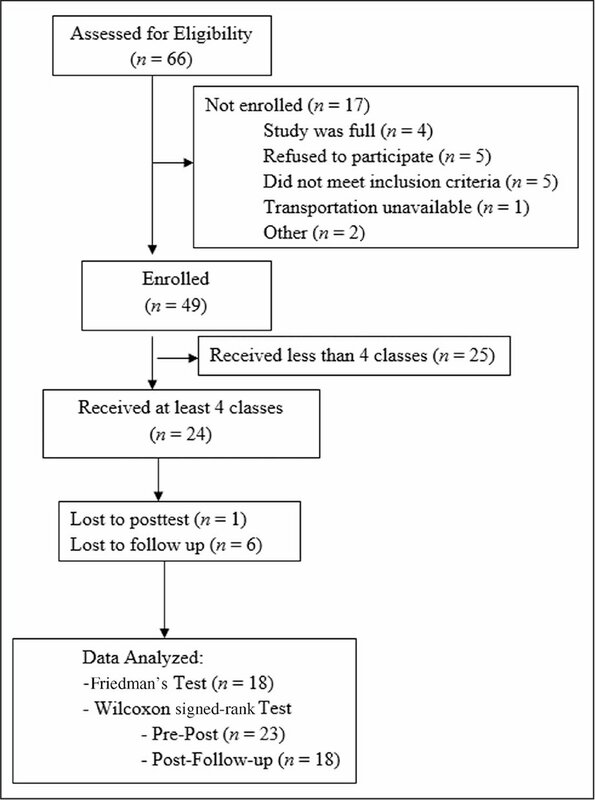 Participant outcome measures were collected during a pretest (O1), followed by a 7-week intervention phase (X1). Data were collected again at the end of the intervention phase (O2). A 5-week maintenance phase (X2) allowed participants to practice EMM in optional group and individual sessions. Outcome measures were collected again during follow-up (O3). Participants were recruited via flyers distributed at Pathways, a nonprofit community health center in a large Midwestern city. Recruitment of participants took place in the spring of 2016 and 2017. Thus, two groups participated in the study to increase the sample size. Screenings were conducted by telephone and e-mail. Eligible participants were sent the class schedule, consent forms, demographic forms, and ability assessment to complete. Participants were selected via convenience sampling before the intervention phase. Inclusion criteria were as follows: (a) a chronic condition; (b) older than 18 years; (c) cognitively able to provide informed consent; (d) capable of performing EMM from a standing or seated position; and (e) attendance at four of five intervention sessions. The intervention phase consisted of five EMM teaching sessions conducted over a period of 7 weeks (Peterson, 2008). The 2 additional weeks were available to allow participants to practice independently and to participate in optional one-on-one consultations. Each teaching session featured a lecture that provided background information on the components of the technique, a group discussion, and time to practice the EMM. Participants were expected to attend at least four of five teaching sessions and to practice for 30 to 45 minutes at least 5 days per week. Participants were given instructional handouts and access to online videos to support individual practice. The Beck Anxiety Inventory (BAI) consists of 21 items that are rated on a Likert-type scale from 0 to 3 to measure the severity of anxiety symptoms (Beck, Epstein, Brown, & Steer, 1988). The total score ranges from 0 to 63. Total scores of 0 to 9 indicate normal to minimal anxiety, scores of 10 to 18 indicate mild to moderate anxiety, scores of 19 to 29 indicate moderate to severe anxiety, and scores of 30 to 63 indicate severe anxiety (Beck et al., 1988). The BAI was moderately correlated to the revised Hamilton Anxiety Rating Scale, r(150) = .51, with high internal consistency (α = .92) and test-retest reliability of r = .75 (Beck et al., 1988). When compared with the Hamilton Rating Scale for Depression and the Cognition Checklist Depression scale, it has low correlation of r(153) = .25 and r(150) = .22, respectively, supporting discriminant validity (Beck et al., 1988). The Beck Depression Inventory II (BDI-II) has 21 items that are rated on a Likert-type scale from 0 to 3 and summed for a total score of 0 to 63 to determine the severity of depressive symptoms (Dozois, Dobson, & Ahnberg, 1998). Total scores of 0 to 9 indicate minimal depression, scores of 10 to 18 indicate mild depression, scores of 19 to 29 indicate moderate depression, and scores of 30 to 63 indicate severe depression (Dozois et al., 1998). This index has high internal consistency (α = .91), high test-retest reliability (r = .93), and high concurrent validity (r = .93) when compared with the BDI-I (Beck et al., 1988; Dozois et al., 1998). The Functional Assessment of Chronic Illness Therapy-Fatigue Scale (FACIT-F) is a self-report questionnaire that evaluates how fatigue affects an individual's daily activities, functions, and quality of life (Smith, Lai, & Cella, 2010). This scale includes 13 items that are measured on a Likert-type scale from 0 to 4, with a total score of 0 to 52 (Smith et al., 2010). The FACIT-F has high test-retest reliability (r = .90), internal consistency (α = .93 to .95), and convergent validity (r = .73 to .84) with the Medical Outcomes Study Short Form 36 (Cella et al., 2005; Smith et al., 2010). The Functional Assessment of Cancer Therapy-General (FACT-G) evaluates quality of life according to the four domains of physical well-being (PWB), social well-being (SWB), emotional well-being (EWB), and functional well-being (FWB) (Webster, Cella, & Yost, 2003). Its 27 items are ranked on a Likert-type scale from 0 to 4 (Victorson, Barocas, Song, & Cella, 2008). The FACT-G has strong internal consistency (α = .88) across multiple chronic conditions and test-retest reliability of r = .66 (Victorson et al., 2008; Weitzner et al., 1995). It is responsive to change, with relative efficiency of .31 and an overall responsiveness index of .84 (King, Bell, Costa, Butow, & Oh, 2014). The GAS is an assessment tool that focuses on goals that are meaningful to each participant (Marson, Wei, & Wasserman, 2009). The five steps in the GAS process include identifying the participant's goals, weighing the goals, defining ideal outcomes, establishing a baseline, and scoring goal achievement (Turner-Stokes, 2009). The GAS has strong interrater reliability (r = .83) (Marson et al., 2009). Systolic and diastolic blood pressure were evaluated with the Omron wrist blood pressure monitor (model BP629). This device meets the validation standards of the European Society of Hypertension International Protocol, with a mean difference of 0.2 ± 1.1 mmHg for systolic blood pressure and −0.1 ± 1.1 mmHg for diastolic blood pressure (Topouchian et al., 2011). After institutional review board approval was obtained, participants were recruited. Participants who met the inclusion criteria were sent consent forms and further documentation through e-mail or postal mail, and these documents were collected at the first class. Data collection occurred over a 12-week period that included an intervention stage and a maintenance phase. At the first session, the researchers administered each outcome measure. Participants who could not attend the first session reported early to the second session to complete the outcome measures. During the last 30 minutes of the first session, the participants learned the eight Yes to Life sequenced Meditative Movements and received the Yes to Life Agreement. The simple movements correspond to the agreement content. For example, the first movement involves nodding the head, incorporating the breath, then speaking the “Yes” affirmation. By performing the movement, participants are acknowledging the life force and their personal power. They were instructed to practice the eight movements and read the agreement according to the practice guidelines. The four remaining teaching sessions were 90 minutes long. Attendance was taken at the start of each session, and those who did not attend received a follow-up telephone call to determine whether they wished to continue to participate. Participant dropouts were documented and communicated to the EMM facilitator. Data were excluded for participants who missed more than one of the five teaching sessions or did not complete the pre-test. The class web page was updated each week, and participants completed a weekly practice log documenting the amount of time they spent practicing and specifying which movements they practiced during the week. The maintenance phase occurred over a period of 5 weeks. Participants were invited to attend optional sessions where the movements were practiced to reinforce previously learned EMM. At the first maintenance session, the outcome measures were administered (posttest). The co-investigators also held a focus group on the barriers and benefits to participating in EMM. This focus group was conducted to determine whether changes should be made to the intervention and to future studies. Follow-up outcome measures were obtained at the end of the final session, and participants received a Power of Positive Aerobics DVD as a reward for participation. Quantitative data were collected and analyzed with SPSS software, version 24. Because of the small sample size, nonparametric statistics were used. Friedman's one-way repeated measures analysis of variance was used to evaluate outcomes across the three measurement periods. A Wilcoxon signed-rank test was used to analyze the post hoc planned comparisons between the pretest and posttest and between the posttest and follow-up periods. Cohen's d effect sizes were calculated and interpreted based on d = .2 as a small effect size, d = .5 as a medium effect size, and d = .8 as a large effect size (Walker, 2008). The GAS data were reported descriptively. The investigators assessed 66 persons for eligibility, and 49 persons were enrolled (Figure 1). The 25 participants who attended fewer than four classes were excluded from data analysis. One additional participant dropped out at posttest. Pretest and posttest measures were completed by 23 participants. At follow-up, six additional participants were lost and one participant returned. A total of 18 participants completed both posttest and follow-up measures. 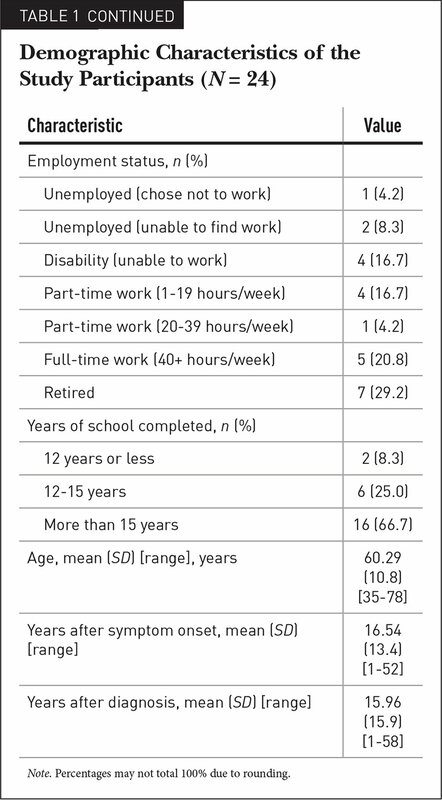 Table 1 shows the demographic characteristics of the 24 participants, who included 20 women and 4 men, with an average age of 60 years (range, 35–78 years). Among the participants, 11 different chronic health conditions were reported as primary diagnoses. Progression of participants through the study. Figure 2 shows the positive outcomes of BAI, BDI, FACIT-F, and FACT-G. Symptoms of anxiety, depression, and fatigue decreased after the intervention. Overall quality of life increased, as shown by increased FACT-G scores. 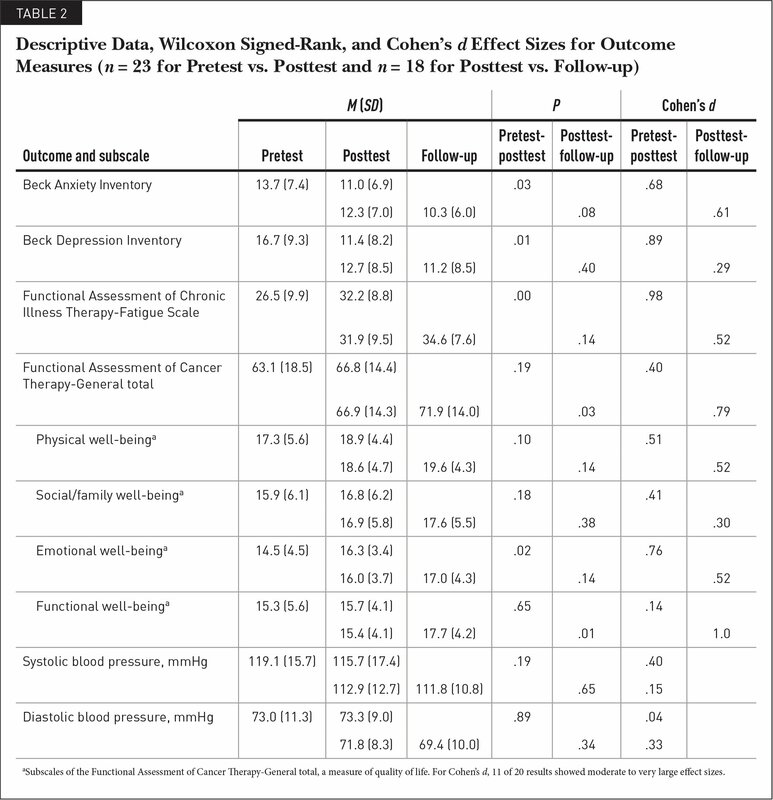 Beck Anxiety Inventory (BAI), Beck Depression Inventory (BDI), Functional Assessment of Chronic Illness Therapy-Fatigue Scale (FACIT-F), and Functional Assessment of Cancer Therapy-General (FACT-G) quality of life (QOL) total mean scores across time. Improvement in BAI and BDI is reflected in decreasing scores, whereas improvement in FACIT-F and FACT-G is reflected in increasing scores. Friedman's one-way analysis of variance was used to measure change across time. Results for the BAI (p = .001), BDI (p = .001), FACIT-F (p = .001), and FACT-G total score (p = .01) outcome measures were significant. FACT-G subscales of EWB (p = .001) and FWB (p = .001) were also significant. The remaining FACT-G subcategories, PWB and SWB, along with systolic and diastolic blood pressure, showed no significant changes from pretest to follow-up. Wilcoxon signed-rank tests examined the pretest and posttest differences (Table 2). Measures of BAI (p = .03), BDI (p = .01), FACIT-F (p = .00), and the FACT-G sub-scale of EWB (p = .02) showed significant improvement. Large effect sizes (d ≥ .80) were seen in BDI and FACITF outcomes. In addition, BAI, PWB, and EWB showed medium effect sizes (d ≥ .50). These results support the first hypothesis. The FACT-G total score, SWB and FWB subscales, and systolic and diastolic blood pressure were not significant. 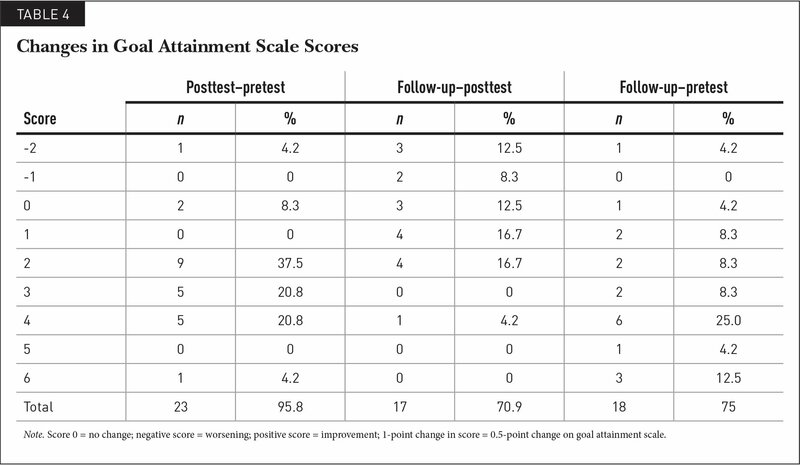 Wilcoxon signed-rank tests were used to determine the significance of changes from posttest to the follow-up period (Table 2). The FACT-G total score (p = .03) and the FWB subscale (p = .01) showed significant improvement, and the latter showed a large effect size (d = 1.0). 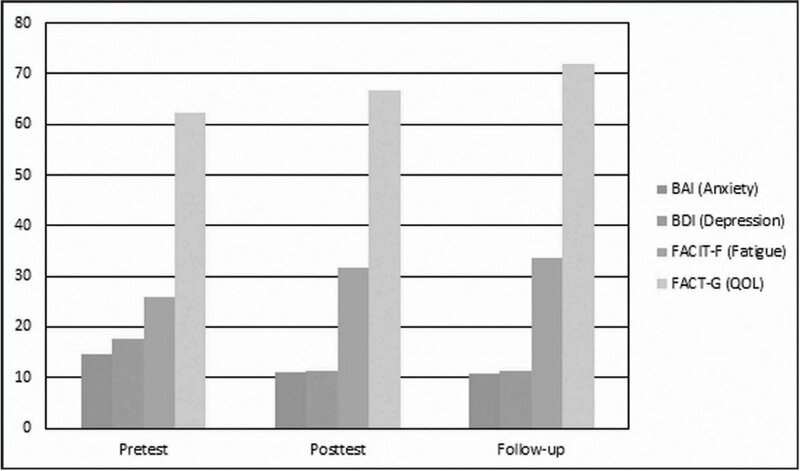 The remaining outcomes did not show a significant change from posttest to follow-up measures. These results support the second hypothesis. The GAS goals selected by the participants included decreasing pain (n = 7), increasing sleep (n = 5), increasing social participation (n = 3), and decreasing stress (n = 3) (Table 3). Additional goals selected included decreasing irritability, increasing meditative practices, increasing physical strength, reducing anxiety, decreasing fatigue, and learning new techniques. Most of the participants (n = 20) reported positive changes on the GAS from pretest to post-test, whereas the remaining participants reported negative results or no change (n = 3) (Table 4). The GAS measures from posttest to follow-up showed that more participants reported positive changes (n = 9), and the remaining participants reported negative results or no change (n = 8). From pretest to follow-up, most of the participants reported positive changes on the GAS (n = 16). Two of the participants did not achieve favorable outcomes on the GAS, with one selecting reduction of pain as the designated outcome and the other wanting to increase hours of sleep through EMM (Table 4). Other participants reported reduced pain (n = 6) and increased sleep (n = 4). These results support our expectation that most participants would improve at least one level of GAS. Subjective effects were expressed during a focus group discussion. Participants described the beneficial effects as improved psychosocial and physical factors, including a more positive outlook, improved sleep and energy levels, and decreased pain. Participants also described barriers to participation, such as lack of motivation, time commitments, and physical factors. Some participants indicated that the timing of the sessions (late in the day) affected their ability to focus. Recommended improvements to the intervention included increasing the length of the program, improving the sound quality of the EMM videos, and decreasing the expected practice time, with a gradual increase as new movements are learned. From pretest to follow-up, participants showed significant reduction in symptoms of anxiety, depression, and fatigue and a significant increase in quality of life, including EWB and FWB. These results support the idea that EMM can have beneficial effects on anxiety, depression, fatigue, and some aspects of quality of life for persons with chronic health conditions. From pretest to posttest measures, participants had a significant decrease in anxiety, depression, and fatigue as well as a significant increase in EWB. The medium and large effect sizes for these findings support the first hypothesis. In contrast, no significant change was found for SWB, FWB, and blood pressure. The positive results are consistent with a study of mindfulness-based interventions in persons with multiple sclerosis (Bogosian et al., 2015). From posttest to follow-up, except for FACT-G and the FWB subscale, outcomes did not change significantly, supporting the second hypothesis. The significant improvement in FACT-G and the FWB subscale exceeded our expectations and may indicate that the maintenance phase of the course is essential to elicit change in these variables. Some outcomes decreased slightly during the maintenance phase, indicating that the intervention phase may need to be expanded or altered to help maintain outcomes. A study of persons with chronic health conditions had similar results, and physical activity partially mediated the effect of chronic illness on health outcomes that are vital for quality of life, including reduced pain and greater emotional well-being (Sawatzky, Liu-Ambrose, Miller, & Marra, 2007). The lack of significant changes in blood pressure may be related to other sources of hypertension, including diet, comorbid conditions, and genetic factors that may prevent a reduction in blood pressure (Bauer, Briss, Goodman, & Bowman, 2014; Esler, 2017; Wang et al., 2006). A pharmacological study presented by the National Collaborating Centre for Chronic Conditions (2006) of patients with chronic illness recommended the use of beta-blockers as an initial treatment to help improve blood pressure. Although the FACT-G and FWB subscale measures increased, all other outcomes regressed slightly. This finding suggests that reduced symptoms of anxiety and depression are expected to occur immediately after practicing EMM, whereas a longer intervention period is required to improve overall quality of life. The GAS findings showed that most participants saw positive effects on their individual goals. Small positive changes were seen from pretest to posttest, with three participants seeing no change or feeling worse than at baseline. From posttest to follow-up, GAS scores showed a highly positive shift, whereas almost no participant remained at or below posttest markers, supporting our expectation of improvement. Only two participants had unfavorable outcomes. Of these, one hoped to decrease pain and the other hoped to increase sleep, but both participants showed a reduction in symptoms of anxiety, depression, and fatigue and increased overall quality of life. Although one individual did not achieve more sleep, a reduction in the symptoms of fatigue suggests that the participant achieved more restful sleep after the intervention. The positive improvements from posttest to follow-up suggest that EMM had a delayed effect on participants' perceptions of goal achievement. This correlates with a study that found that GAS goals of lifestyle factors, stress, physical activity, and nutrition showed consistent positive improvement for up to 3 to 5 months (Becker, Stuifbergen, Taxis, Beal, & Pierini, 2009). This finding indicates that the GAS may be useful in occupational therapy practice because goals can be individualized to client needs to achieve long-term care goals in individual interventions or community-based health programs. Overall, the subjective reports of the participants were positive, and they showed an improvement in psychosocial factors, including a more positive outlook, greater self-confidence, improved sleep and energy levels, and reduced pain. They also indicated that negative thoughts, lack of motivation and time, and physical symptoms were barriers to their participation in the intervention. These reports are similar to the findings of Payne and Crane-Godreau (2013), whose participants reported positive effects and barriers to participating in a meditative movement intervention. This finding emphasizes the importance of modifying interventions and addressing barriers that prevent participation. Strengths of the study included participants with 11 different conditions, suggesting that these findings can be generalized to various chronic conditions. The structure of the intervention allows for easy replication. Additionally, the outcome measures used were valid and reliable standardized measures. A major limitation of this study was participant attrition, which is likely a result of the nature of the participants' chronic conditions. Reasons for dropout included lack of transportation; scheduling of sessions during peak traffic hours, leading to a difficult commute; and symptoms of fatigue and pain. The attrition rate and the small sample size (n = 24) could contribute to outcome bias. However, the medium and large effect sizes suggest that the positive effects could be real. The absence of a nontreatment control group limits the ability to attribute significant outcomes to the intervention as a result of concurrent treatment, medication, or history effects. Finally, the sample was primarily composed of White women, which limits the generalizability of the results. Future researchers should conduct a large randomized control trial on the effects of EMM to enhance the statistical power of the study. A comparison control group should be added to exclude alternative factors that could influence outcomes. Researchers should further examine the difference in effects of the EMM intervention in a group setting versus independent practice. To limit the dropout rate, future studies could hold class in midmorning, a time when participants are less likely to be fatigued and an easier time to commute. A future study should attempt to recruit a more diverse sample to enhance the generalizability of the findings to a broader population. Additionally, a long-term follow-up study should examine whether the beneficial effects can be maintained over time. Occupational therapy plays a large role in wellness and health promotion by enabling individuals to maximize their participation in everyday occupations. Occupational therapists play a unique role in aiding persons with chronic health conditions to manage their symptoms, enabling them to increase their participation in desired occupations and improve their quality of life, in addition to preventing occupational deprivation or imbalance (American Occupational Therapy Association, n.d.). This study showed that EMM was associated with improvement in outcome measures, including symptoms of anxiety, depression, and fatigue, resulting from chronic conditions. In addition, EMM may be effective in improving several facets of participants' quality of life as well as their subjective view of their health status. The positive findings of this study indicate that EMM is a potential intervention that occupational therapists may use to aid clients with managing symptoms, improving aspects of quality of life, and increasing participation in daily occupations. Persons living with chronic conditions face many physical limitations and often have comorbidities that exacerbate symptoms and the fatigue cycle. The chronic nature of these conditions is marked by ongoing symptoms with no effective cure. Therefore, management of symptoms is of great importance. The findings of this study suggest that EMM is associated with improvement in anxiety, depression, fatigue, and emotional well-being. Additionally, EMM may help persons to meet individualized goals, such as decreasing pain, increasing sleep, increasing social participation, and decreasing stress. Fatigue management that incorporates complementary alternative medicines, such as EMM, should be explored as a mechanism to ameliorate chronic symptoms and improve quality of life. Cella, D., Yount, S., Sorensen, M., Chartash, E., Sengupta, N. & Grober, J. (2005). Validation of the Functional Assessment of Chronic Illness Therapy Fatigue Scale relative to other instrumentation in patients with rheumatoid arthritis. Journal of Rheumatology, 32(5), 811–819. Centers for Disease Control and Prevention. (2013). 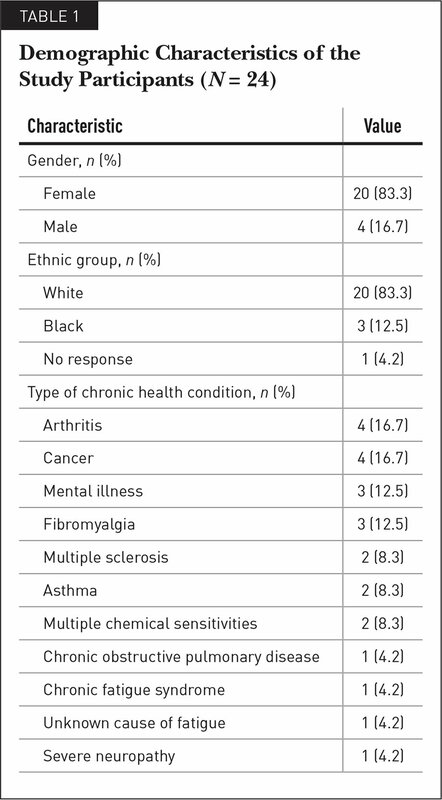 Prevalence of doctor-diagnosed arthritis and arthritis-attributable activity limitation—United States, 2010–2012. Morbidity and Mortality Weekly Report, 62(44), 869–873. National Collaborating Centre for Chronic Conditions. (2006). Hypertension: Management in adults in primary care: Pharmacological update. London, England: Royal College of Physicians. Peterson, E. (2008). Meditative movements. Minneapolis, MN: Ellie's Meditative Movements, LLC. Ms. Emmons is Occupational Therapist, Independent School District 197, Mendota Heights, Minnesota. Ms. Felts is Occupational Therapist, Minneapolis, Minnesota. Ms. Peterson is Health & Wellness Educator, Minneapolis, Minnesota. Dr. Mathiowetz is Associate Professor, Program in Occupational Therapy, University of Minnesota, Minneapolis, Minnesota. The authors thank Tim Thorpe of Pathways, who provided space for data collection; Alisha Bruner, Whitney Buesgens, Karlee Davis, Katie Perovich, Emily Westmark, and Timothy Wheeler, who assisted with data collection and analysis; and all study participants, without whom the study would not have been possible. Address correspondence to Virgil G. Mathiowetz, PhD, OTR/L, FAOTA, Associate Professor, Program in Occupational Therapy, University of Minnesota, MMC 368, 420 Delaware St. SE, Minneapolis, MN 55455; e-mail: mathi003@umn.edu.